It has been over one years since, Saheed Vassell a 34-year-old Black man was murdered by the New York Police Department in Brooklyn. Four police officers, three of whom were dressed in plainclothes, fired, at minimum, ten shots at Saheed as he stood on a street corner in broad daylight. The police were shooting so recklessly that a bullet went through the window of a corner store that Saheed was standing near. Despite a year of continued advocacy from Saheed's family none of their demands have been met. The officers who killed Saheed are still working for the NYPD and New York Attorney General Letitia James announced that her office would not bring criminal charges against the Strategic Response Group officers who killed Saheed. 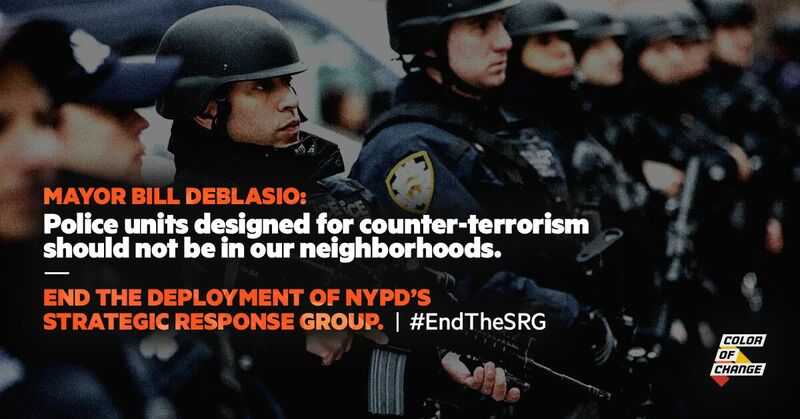 The Strategic Response Group (SRG) is a hyper-militarized unit of the NYPD that boasts about having a squad of 700 "highly-trained", heavily armed officers. The SRG was established in 2015 to respond to civil unrest and terrorist incidents however, they are deployed in Black and brown communities constantly--this must stop. The SRG officers are not equipped to respond to police calls, they are not trained to work in communities nor should they. Mayor Bill de Blasio has the power to end NYPD's deployment of the Strategic Response Group--join us in demanding he do so. It has been over a year since Saheed Vassell was gunned down by four NYPD officers in Crown Heights, Brooklyn. We are disappointed and outraged that no charges will be brought against the officers who killed Saheed. We are also deeply concerned about the fact that all four officers involved in Saheed's murder are still working for the NYPD, posing a serious public safety threat to New Yorkers. The officers who killed Saheed are members of the militarized Strategic Response Group (SRG). The SRG was created to respond to civil unrest and terrorist incidents however, they are deployed in Black and brown communities constantly--this must stop. We call on you to end the the over-deployment of the hyper-militarized Strategic Response Group in communities, who's officers responded to police calls about Saheed. We demand action from you immediately.